Honeynut squash is easy to roast and incredibly delicious. Unlike its winter squash relatives, this variety offers an abundance of natural sweetness once roasted. This seasonal side will brighten any plate with its beautiful orange glow. Using a spoon, scoop out and discard the seeds and pulpy insides. Drizzle the cut side of the squash halves with oil or use a brush to apply a thin layer. Season with a generous sprinkle of fine sea salt and freshly ground black pepper or to taste. With the honeynut squash halves cut side face down, roast for 20 to 25 minutes or until a fork can easily pierce through the skin to the fleshy inside. Remove from the oven and carefully flip the squash halves over, lifting from the top half of the squash. The sides along the base (or fashioned bowl) will be the most fragile. Serve immediately (or see recipe notes on how to store and reheat). To Enjoy: Using a fork, dig into the fleshy inside. Don’t worry if you find yourself scraping all the goodness down to the skin. Totally acceptable! Cutting the Squash: If the honeynut squash is too difficult to cut through, soften the squash in the microwave first. With a fork, pierce the exterior of the squash (as you would a potato) and then microwave on high for 30 seconds to 1 minute. Be careful: the squash may be hot and when first cut into, may release hot steam. To prepare in advance, roast the squash per the recipe instructions and proceed with the following steps. Once roasted, allow the squash to cool completely in the refrigerator. Simply transfer the roasted squash halves – cut side face up – to a plate and place in the fridge. Once cooled, transfer the squash halves to an airtight container and refrigerate. If you see condensation collecting on the inside of the container lid, prop it open slightly to allow any excess moisture to escape. Wipe up any condensation before securing the lid. 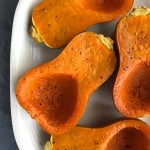 On a parchment lined rimmed baking sheet or in a baker, reheat the honeynut squash halves cut side face up in the oven for 10 to 15 minutes or until heated through.